Sour Soup? The word “sour” may be off-putting to some and not a taste that is immediately appealing. The name of this dish is the direct translation for this soup’s Vietnamese name “Canh Chua” but some subtleties get lost in translation. I’d rather call this “Perfectly Balanced Tart, Savory, and Sweet with Abundant Vegetables and Hearty Fish Soup” but that’s quite a mouthful. So, unfortunately, the name gets abbreviated to something most people recognize. My point: Please don’t let the name of this soup turn you off to trying it. It is a wonderful balance of flavors and textures and much more than just “sour” so I hope you’ll give it a try! A good base is essential for this soup. I prefer a chicken stock or broth which adds taste without dominating the soup’s primary flavors. Fish is usually the meat of choice in this soup. Catfish, specifically catfish steaks, are often used. I am not a big fan of eating fish with bones, especially in soup, so opt to use fish fillets. Feel free to use a fish you enjoy but, select a sturdy fish that will hold up well to boiling like red snapper, halibut or mahi mahi. Shrimp is a good alternative as well. If using shrimp, cook them in the stock until they turn pink (about a minute or so). Remove and set aside in a bowl. Add the shrimp back to the soup once the vegetables are done cooking. The timing of this soup is important. You don’t want to over-cook the fish but you also want your vegetables to be cooked properly. The fish fillets take about 5-7 minutes to cook depending on the thickness. If you’re not sure how to time everything, you can cook the fish first and then remove from the soup. Then cook your vegetables to the doneness that you like and add the fish back into the soup just before serving. Regarding the tartness, if you’re not sure how much you can handle, add just half of the tamarind sauce per the below recipe and adjust from there. If it’s too tart, add the pineapple juice (leftover from the canned chunks) or add more sugar to balance the flavors. I use canned pineapples chunks because it’s convenient and I don’t have to buy a whole pineapple. At my house we love pineapples so I use the entire 20 oz can. Elephant ear stems can be difficult to find and so you can substitute with celery. The rice paddy and sawtooth herbs are essential greens for this dish. Again, they can be difficult to find unless you go to an Asian grocer. If you don’t have these herbs, substitute with other fragrant herbs like Thai basil or cilantro. At my local 99 Ranch Market, they sell a packaged Sour Soup mix which contains elephant ear stem, okra, tomatoes and the fresh herbs. Super convenient! You have the basics and can add whatever else you like. As a shortcut for making the tamarind sauce, you can use the powdered tamarind which is inexpensive and pretty good. Just a quick note, most of these packets contain MSG. If you want to enjoy this dish the Viet way, serve it with a side of undiluted fish sauce with chopped red chilies. To complement the tartness of this soup, you’ll want to serve it with a savory dish like Braised Fish in Clay Pot (Ca Kho To) or Braised Pork and Shrimp. Cut the fish fillets into smaller sections. Drizzle 1/2 Tbsp fish sauce on the one side and sprinkle with ground black pepper. Flip the fish over and drizzle with another 1/2 Tbsp fish sauce and add more ground black pepper. Allow the fish to marinate while continuing with the next steps. Peel and mince the garlic. Set aside in a small bowl. Cut off a section of the wet tamarind and then cut into small chunks. Add into a measuring cup along with the hot water. Mash the tamarind and mix it with the water for 5 minutes or until a thick sauce forms. Strain the tamarind using a sieve. Set the sauce aside for now. Trim ends off the okra. Cut the okra at a diagonally, making 1/2-inch thick slices. Cut tomatoes in half and then into wedges. Drain pineapple chunks and set aside. Remove skin from elephant ear stem using a vegetable peeler. If the stems are thick, cut in half lengthwise. Cut the stems at an angle making slices that are about 1/2-inch thick. Coarsely chop the rice paddy herbs and sawtooth herbs. Set aside for later use. Heat a large pot over Medium heat and when hot add vegetable oil. Add the garlic and stir-fry until golden brown, approximately 30 seconds. Transfer into a bowl and set aside for now. Add the chicken stock into the same pot, cover and bring to a boil over High heat. Add the fish (do not cover) and cook until the stock comes to a boil again, approximately 3 minutes. Reduce the heat to Medium. Add the sugar, fish sauce and tamarind mixture. Gently stir everything together. Add the okra and pineapple chunks and cook for 2 minutes. Add the elephant ear stems and cook for 1 minute. Add the bean sprouts. Gently stir everything together. Cook for another 1-2 minutes. When serving, garnish the soup with the ground black pepper, rice paddy herbs, sawtooth herbs and fried garlic. 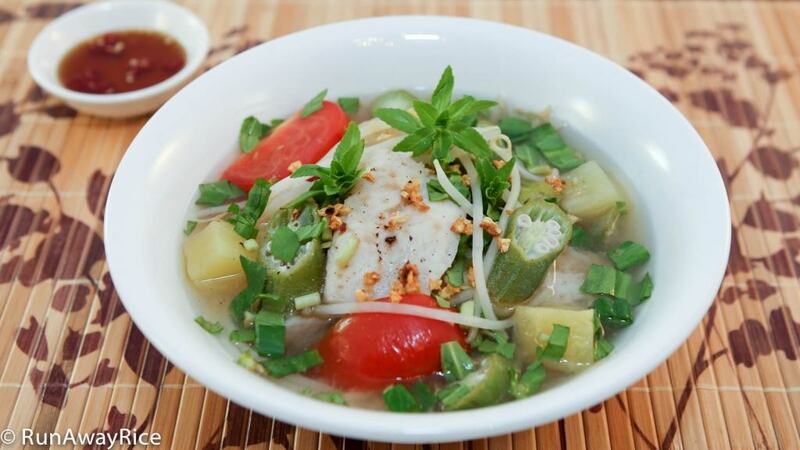 Check out this link to learn more about herbs: Quick Guide to Vietnamese Herbs.